The Derby Swissonic from the ESA Dynotron family is the most akward jump minute (!) 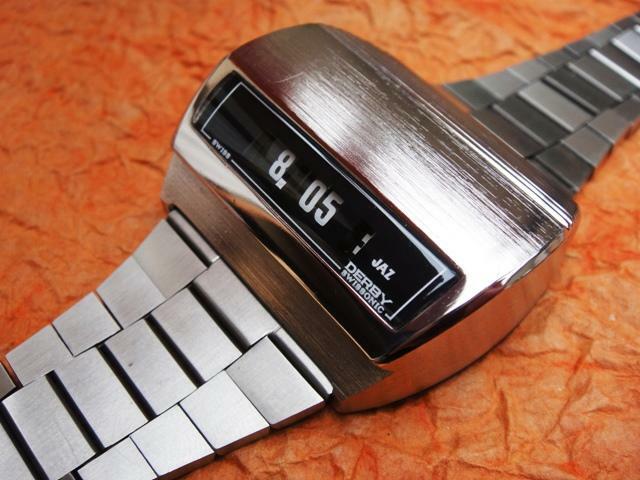 watch ever created for mass-production. 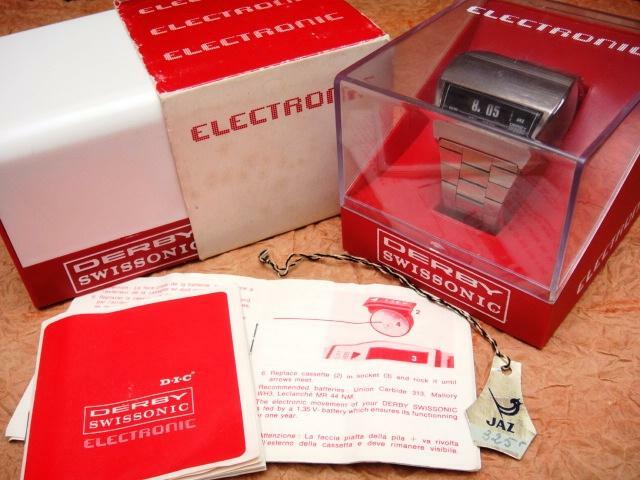 It was introduced somewhere in 1975 by Derby SA (an ESA subsidiary) and featured an ingenious (plastic) speedometer drum-machine powered by a 7-jewel transistorized electromagnetic module. 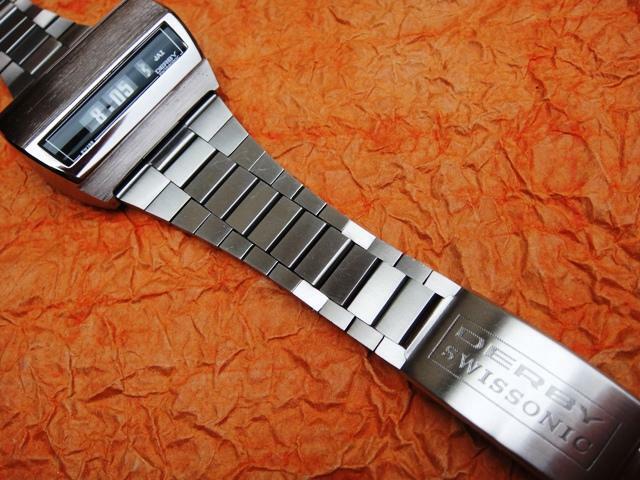 The ESA9176 movement was exclusive to Derby watches but also sold under the French "Jaz" brand thus easier to source in France and Switzerland. 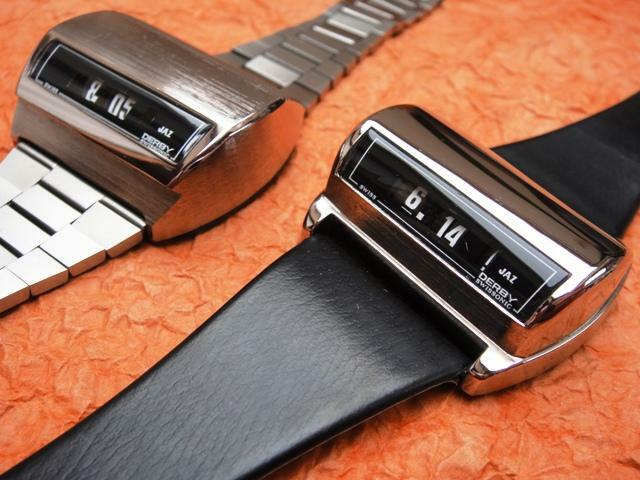 Two models were made in chrome or goldplate with semi-leather strap or stainless steel bracelet. 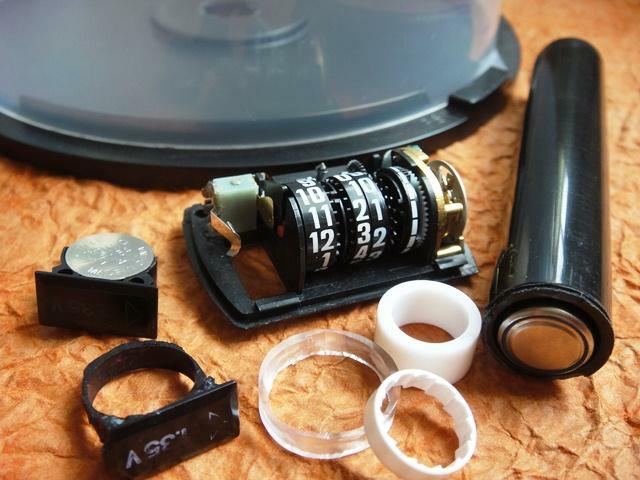 The watch is operated by a 357 1,5V cell (1,35V mercury are no longer made) inserted through a plastic hatch on the caseback where also the setting crown is located. 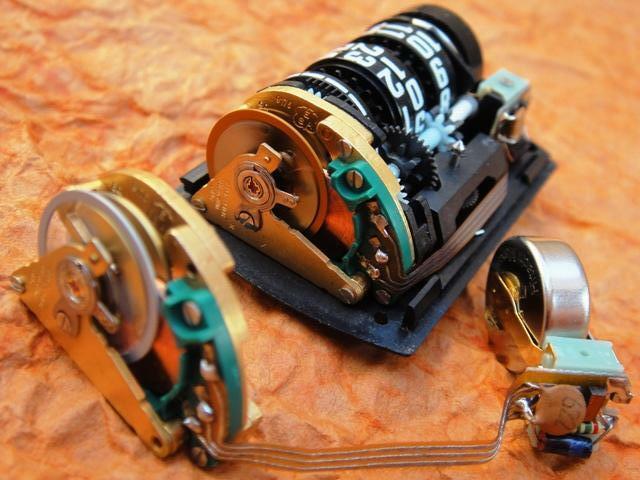 The battery activates an electromagnetic coil which operates a balance wheel with permanent ferrite magnets...exactly the same way as in other Transistorized Electrics. 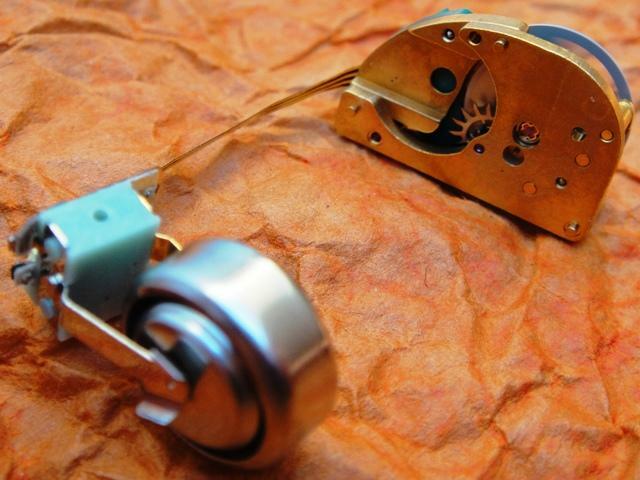 The rotating roller jewel on the balance moves an index/escapement wheel which transfers torque to a long metal rod on the drum-machine filled with a row of teflon-type gears. Corresponding gears move the seconds-drum which gradually rotates/jumps the first minute-drum every 60 seconds, then the second minute-drum every 10 minutes and all of the drums including the hour-drum every 60 minutes. 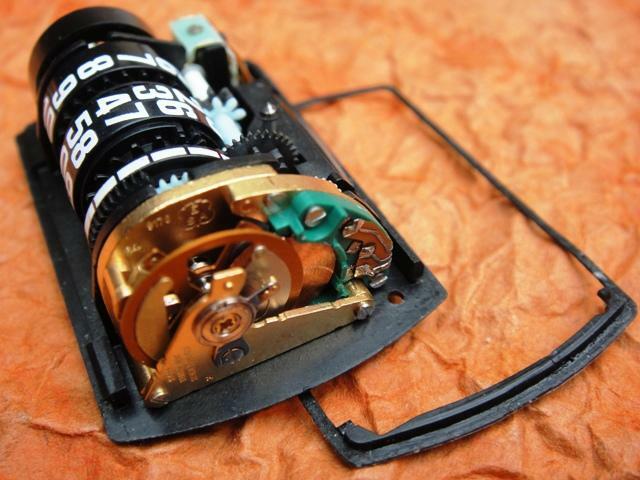 The jumping functionality is obtained by means of a tiny and delicate spring installed permanently on a light-blue wheel combined with the seconds-drum. This "invisible" spring is a major issue with these watches and results in 50% of malfunctions. 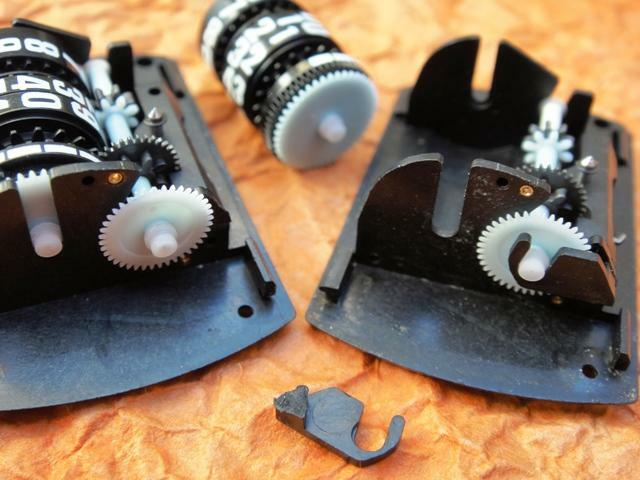 The Derby is a smart but erratic invention also due to plastic parts. Despite space-age materials the movement was not tested sufficiently before being launched to market. 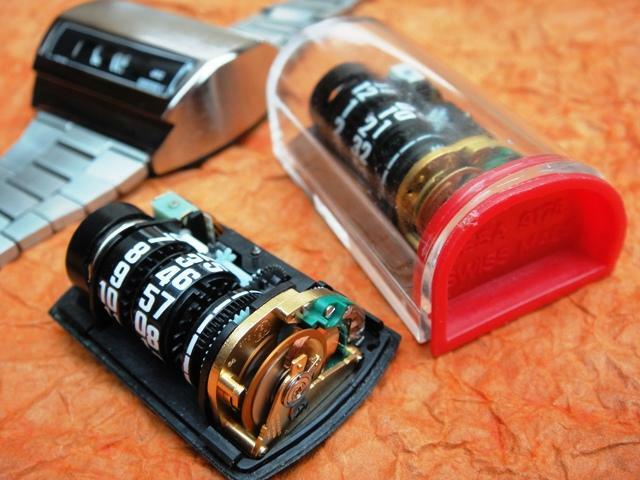 In result most Derbys do not operate correctly nowadays, excluding such reasons as damaged coils and transistors. 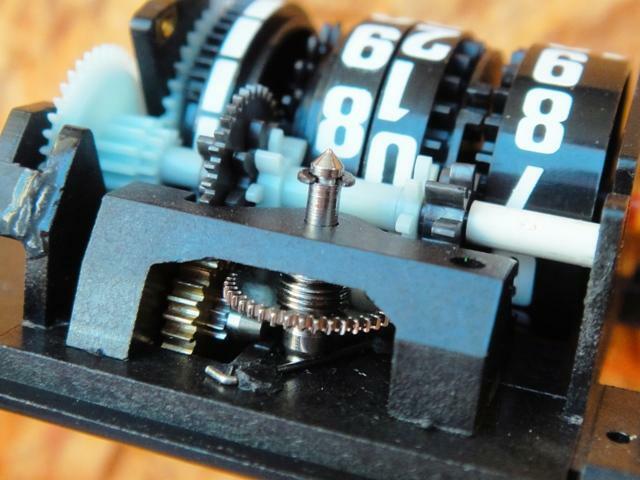 Plastic gears and the caseback might be broken if abused, especially if it has been screwed in to tightly causing the movement to stop. If you want to be happy with your Derby you should ask all necessary questions before buying one. It might be sold as working although the electromagnetic motor-module might work alone after installing a battery but the drum-machine will not advance the time. The easiest and very uncommon reason will be jammed gears but the deeper we go the more issues we might experience. Hints: Before you begin any surgery with your Derby observe the movement for a while and check where it might be stopping. If it tries to jump give it some assistance by turning the gears with your fingers. 1) A golden setting gear aside the crown might need to be greased or disassembled and cleaned. 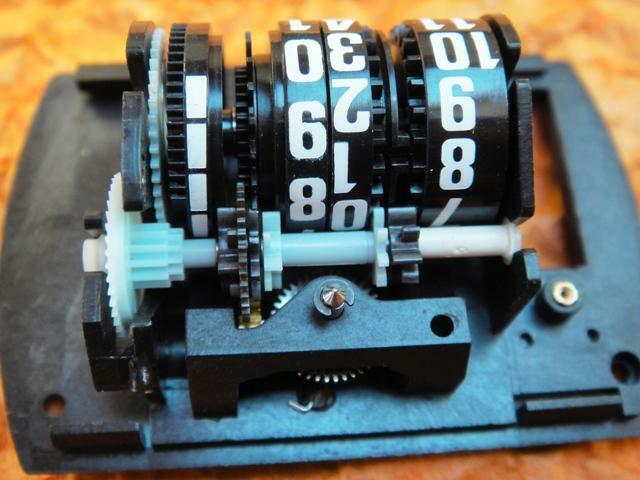 It is press fitted with a pinion to the plastic caseback. 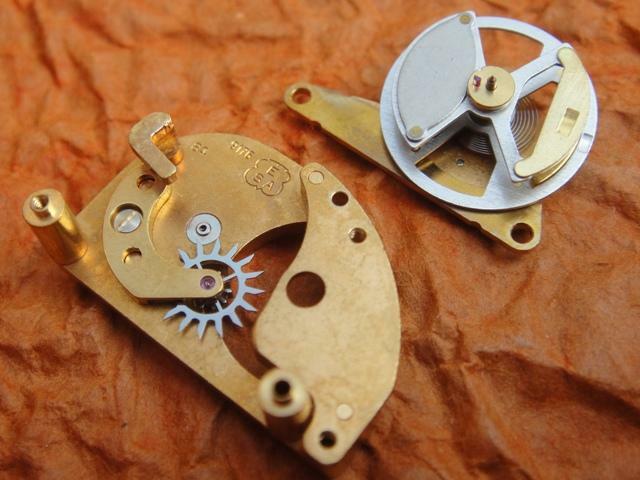 Slight tension from this brass gear and the movement will not jump. 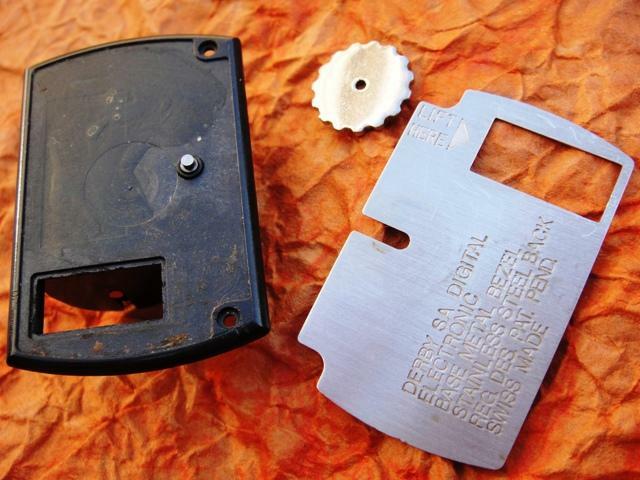 2) Sometimes the battery clip is broken due to improper batteries being fitted. 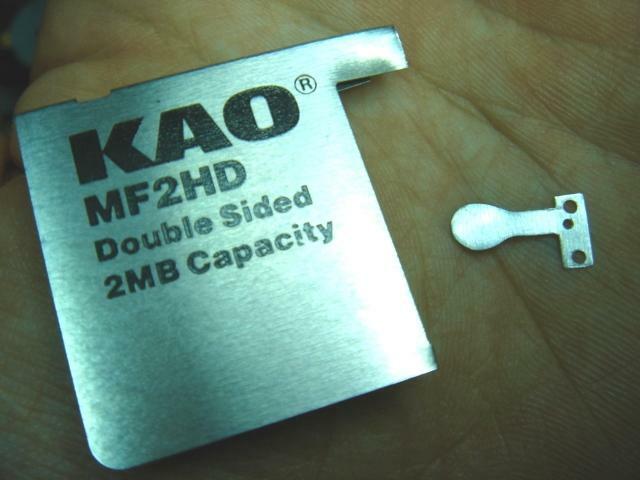 This can be replaced by cutting a matching piece from a beer can. 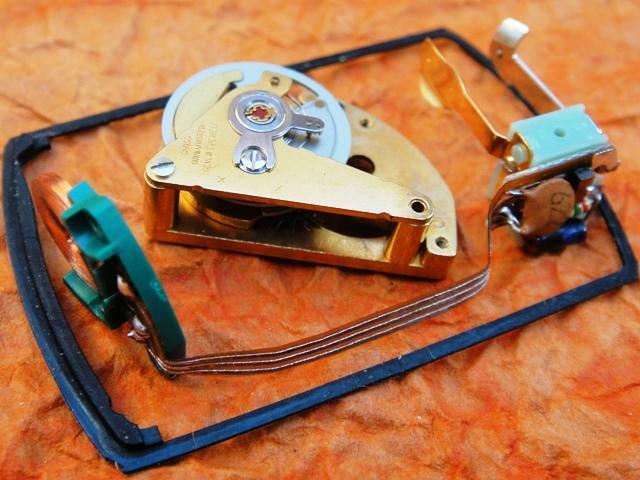 3) As shown above you should start surgery with removing the black gasket and making access to screws. 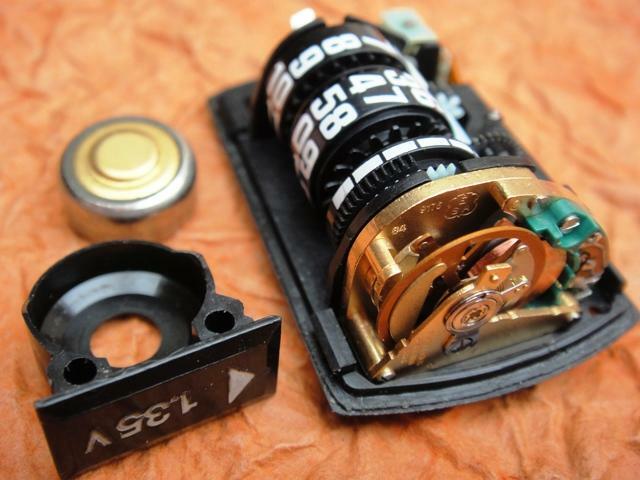 Before you remove the motor with battery-clip (to check if it works alone) check if the movement works in all positions (horizontal, on the right, left). If it stops in some positions it means that the balance pivot is worn out and results in the balance moving horizontally in between both jewels. A loose balance will not rotate properly because the electromagnetic coil will no longer fit perfectly between the gap of the balance wheel. An improper (magnetic) distance in between the coil and balance magnets will cause erratic rotations and the balance might even scratch the surface of the coil causing permament damage (open-circuit coils are sometimes repairable with silver epoxy). You can repair a broken balance pivot on a lathe (timeconsuming, expensive) or source an identical balance from an ESA9157/58 but remember to turn the roller table by 180°. The least professional quick-fix is to punch the lower balance jewel by a few microns inwards thus reducing the loose distance. 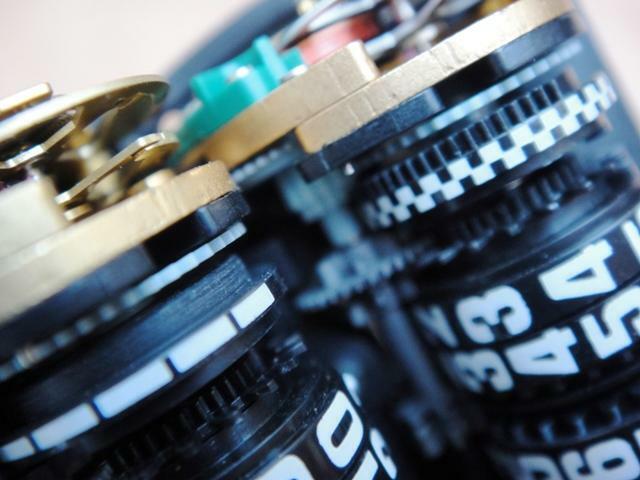 4) If the motor-module works proceed to the drum-machine. 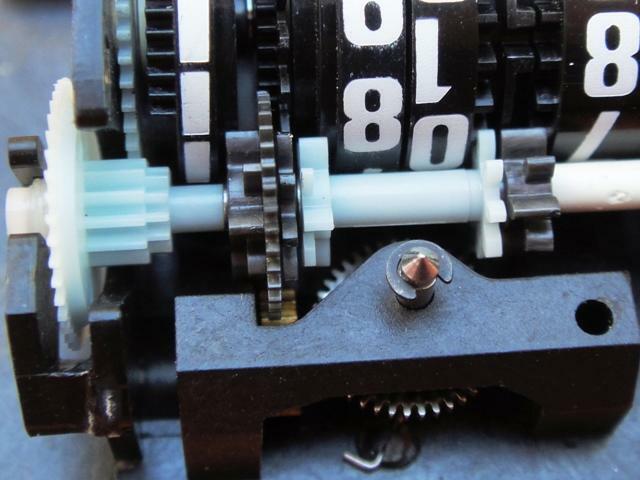 Rotate the gears manually to check if the seconds-drum creates enough tension to produce a jumping functionality. If not then the jumping-spring is more than likely broken. It is fixed permanently to the light-blue wheel which rotates independently and slightly quicker within the seconds-drum. The spring gathers power in between every rotation and releases it suddenly when a gear on the metal rod falls into the indentation on the seconds-drum. This results in an instant jump-minute functionality. 4a) Remove the rod with gears by rising it upwards and remember the sequence and positions before disassembling. Cleaning them with alcohol is a good idea. Remove the drum-machine in the same way by lifting it gently upwards by the pinion from each side. 4b) Repairing the jumping-spring is almost impossible so a factory-modification can be used - comparison shown to the left. This requires removing the teeth of the seconds-drum (on a lathe) and gluing the light-blue wheel into the seconds-drum. Both parts were rotating individually before but after this modification the blue wheel will be responsible for rotating the seconds-drum. Unfortunately this solution will no longer provide a jump functionality but rotate the minutes gradually. 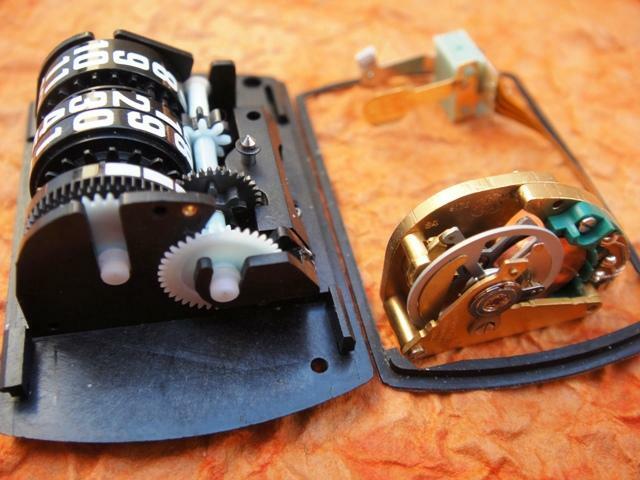 I found such identical repairs in a few watches so the idea was probably applied by Derby as a quick work-around, it's not perfect but allows to enjoy a functioning watch. The Derby is a brilliant yet stupid invention, once you solve one issue another one is just around the corner. It is my main expertise so feel free to ask for service.